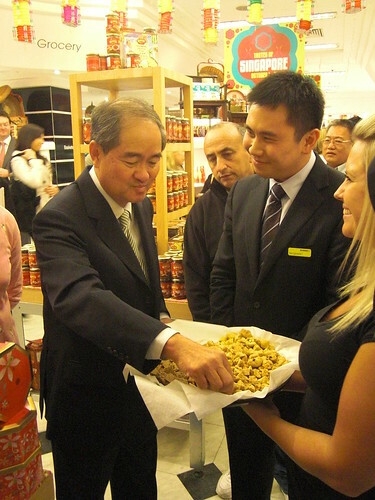 This week, Singapore invades Selfridges, flooding the food hall with various tastes and brands imported over from Singapore. Being located so close to Malaysia, much of its food mirrors that of the peninsula, with strong Indian, Malaysian and Chinese influences in its cuisine. A few bloggers and I were invited (and guest "blogger" @foodbymark) to taste a bit of food, check out the food hall and enjoy a Singapore Sling or two. 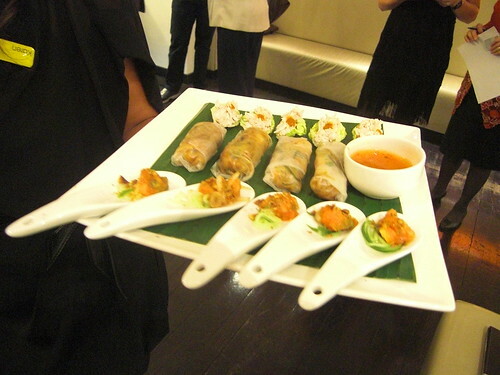 Nice selections of canapés were brought round, punctuated by a tiny laksa with a fierce kick. After a little bit of mingling (where I met @sulineats of Tamarind and Thyme and managed to miss @bribedwithfood) we were introduced to the High Commissioner of Singapore and chatted about why food is so important to Singaporeans. The general consensus was that it was a very important reminder of home, although for my family, food acts as a binding agent. At 7pm every day without fail, my family (all six of us) would sit down together and eat dinner. It gave us a chance to talk and find out about each other's days, something I honestly miss. We were then led down to the food hall where it had been decorated with over 500 lanterns. 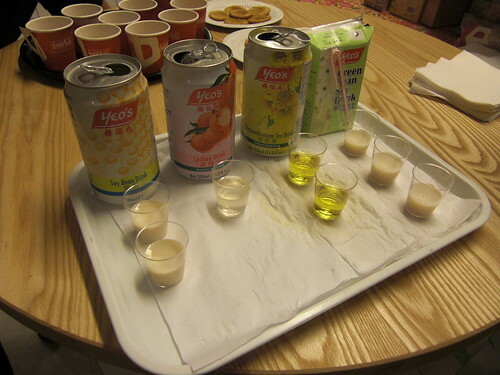 First we came to the Yeo's products. Chrysanthemum tea, lychee juice and soya bean milk, all drinks of my childhood. Next up was something that was new to me, a selection of biscuits from BengawanSolo. I had never heard of this brand before, but apparently they are quite well regarded in Singapore. I can see why, they were delicious, I couldn't stop myself from trying the wide variety available. Even the high commissioner was getting involved. The principal of many of these products is if they do well this week, Selfridges will retain them. Although on the pricy side, I hope these do well. There were a variety of other products on show (including a do it yourself Hainanese chicken set in a box!) and eventually we found ourselves at the live display. With various cooking displays on every day during the festival, they each use some of the ingredients found on the shop floor. On this occasion, fried rice with flavours and ingredients I had never experienced before. I mean, no egg?? Strange and not my cup of tea, but others were happily devouring it. 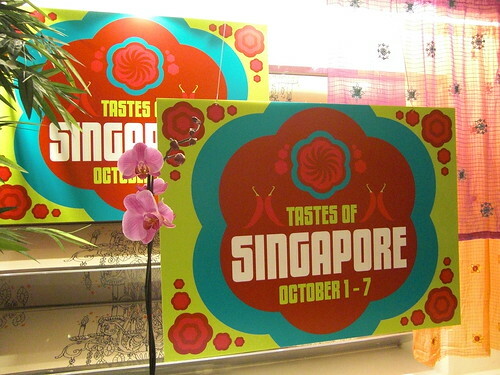 The Taste of Singapore is on in the Selfridges food hall until the 7th October. 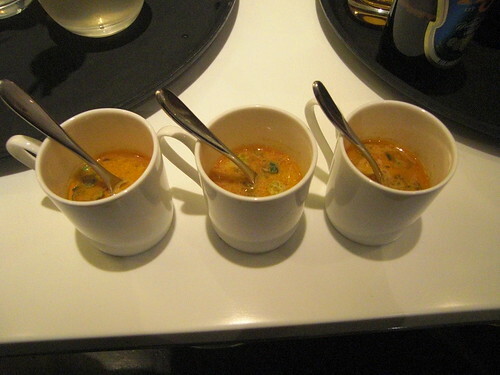 If you fancy a sit down meal, a special Singaporean menu can be found in the Gallery. The highlight? The specially imported Singapore Sling in a bottle (from True Heritage Brew), selling it's wares outside of Singapore for the first time. Modelled on the original Raffles recipe, you can't fault it for authenticity. I definitely have to check this out! What fun! Andre invited me and sadly I couldn't make it. I'll try and pop down to Selfridges (any excuse) before it ends! If Selfridges bring Bengawan Solo's pandan chiffon cake to London, I will never, ever complain about food here again.